This is the updated version of an article originally published on March 1, 2013. Changes include: updated information, fixed broken links, code syntax highlighting, added featured image. As websites and pages have become more complex, CSS quickly buckles under the weight. It’s still a thousand times better than tables for layout but it could present some limitations for those working with it. This is where CSS preprocessors come in. They add a new layer of awesome on top of a syntax we already know and love. There are many CSS preprocessors out there, but I’m going to focus on the one that captured my heart: Sass. You’re going to learn about the difference between Sass indented syntax and .scss syntax, the range of tools you can choose from to work with Sass, fundamental language features and syntax, and some great Sass extensions that will make styling webpages quicker and fun. Sass is a a CSS preprocessor. This is a piece of software that adds a nifty new feature-set to CSS like variables, nesting and mixins. You write in a slightly modified CSS-like syntax which is then processed into plain-ol’-CSS. This processing can either happen on your development environment as you’re coding or as a part of your deployment process. This is the big question, and there is no single answer. For me, Sass provides the right tools, syntax and extensions. Sass has a huge community behind it and is constantly growing and evolving. There are loads of excellent add-ons and extensions which make Sass even better. Sass also gives you two writing style options. This is like the crazy, wise uncle of CSS: quirky, kinda funny looking, but ultimately quite smart. This syntax looks nothing like CSS — its goal is brevity. Instead of brackets and semicolons, it uses the indentation of lines to specify blocks. Where you’d use a semicolon to separate statements, it uses new lines. .scss is essentially a subset of the CSS3 syntax. This means that every valid CSS3 stylesheet is valid.scss as well. This is my preferred syntax and what I’ll be using to show examples throughout this article. So without further ado, let’s get cracking. There are two common ways to roll the preprocessor into your workflow. The first is to do it at build time. This will require some setup on your development and live environments using a parser for the programming language you choose. Rails 3.1 and up ships with Sass. If you use PHP, .NET or Java you’re in luck, as there are ports for those platforms. You could also roll it into a GRUNT/Gulp task or get Webpack to run the procressing on build. If none of this makes sense to you, don’t be afraid! The second option is much more beginner-friendly: use a simple GUI on your development machine and compile as you go. You will need one of the following tools. This is a cross-platform (Linux, Mac, and Windows) GUI tool for compiling Sass and other preprocessor languages. It’s really feature rich and at the time of writing it’s available for free unlimited trial. Let’s Start Coding Sass, Already! This is probably the most fun but also the most dangerous part of Sass. Let’s consider the following two examples. Let’s all agree that’s a nightmare. One of the guiding principles of modern CSS should be the principle of modular code, that is to say, bits of code that you can reuse without having to rely on the structure of your markup. For more information on this idea, look into OOCSS and SMACSS. There’s a de facto rule called The Inception Rule that simply states you should never nest more than four selectors deep. 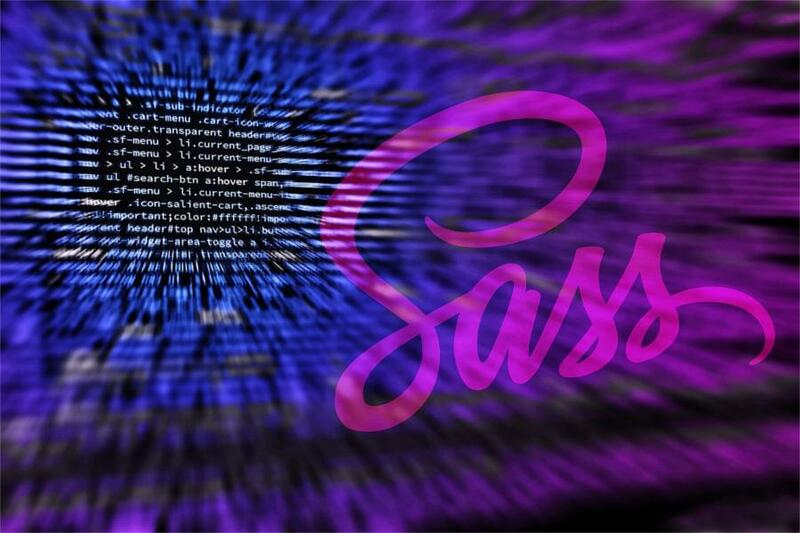 Like any programming language, Sass comes with a suite of functions and standard operators. There are many functions that will help you deal with number, text and colors. And numbers (including those with units) have all the math operators you’ll ever need: +, -, *, / and %. Have a look at the documentation to see the list of goodness available. Mixins are one of the most powerful parts of Sass and really allow you to get creative. A mixin is a collection of of re-usable styles, properties and selectors. You could think of a mixin as a macro or snippet for regular re-use. Needless to say, you’ll be spending a lot of time coming up with your own personal arsenal of mixins to use on all your projects. Each of those @import statements includes a new .scss file. When naming these component .scss files, make sure you use an underscore (_) character at the start of the file name. Example: _variables.scss, _normalize.scss. The Sass compiler will interpret these files as snippets and won’t actually preprocess them individually. Only the files you want the preprocessor to compile should be named without an underscore, e.g., style.scss, special-page-override.scss. When you import the snippet files into your main style file, there’s no need to include the underscore of the file extension because Sass knows you’re working with .scss files. As you might have guessed, it makes total sense to organize your Sass files into folders for easy separation of logic and structure — you can get as complex as you need, but remember that everything you do will need to make some sort of sense six months down the line when you come back to modify stuff. Don’t make it more difficult for your future self (or a different developer). There are a number of excellent add-ons or frameworks built on top of Sass. But I’m going to talk about just one — the almighty Compass. Working with Sass and Compass makes me smile. In actual fact, I’m smiling as I write about Compass and I’m hoping you will be too when you’re done with this article. Compass is a full-featured framework built on top of Sass that includes reusable patterns, sprite generation, typographic rhythms and all the CSS3 mixins you’ll ever need. The compiling software I mentioned above will all be able to deal with Compass, so getting started with Compass is a very simple process. Check out this Gist for an example of config.rb file. Sprites have quickly become the default standard for delivering images on the web using CSS. In short, you create one big image containing all the smaller images your page needs, thereby reducing HTTP server requests, which is good for website performance. If you’re unfamiliar with the concept, then I suggest you have a quick read about it. Sprites are great for the web but they can very quickly become painful to maintain. I often find I have to update my sprites as a project progresses and this becomes a chore as you not only have to update your main sprite sheet but you also have to update your CSS (and potentially HTML, too). Over the years, there have been some great tools introduced to help make this process easier, but nothing has quite sat right with me. Until now. The main idea here is that you should create single images as you would have in the olden days. 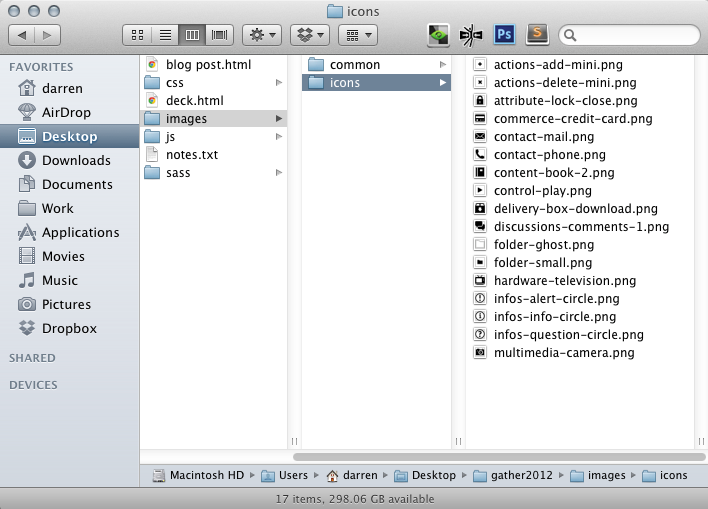 The important thing is to keep your images organised into folders, as illustrated below. I’ll walk you through what’s happening in the snippet above. The include line is where some magic occurs. This line will auto-generate a bunch of class names based on the name of the image folder and the name of the PNGs therein. Now, you could just walk away and happily use those generated classes wherever you wanted. Job done. Thanks, Compass! However, I often find I’ll need to add my own class names — based on nested elements, perhaps. No worries. Compass allows us to do this. Note: With the following examples, the param passed into those icons-sprite-*() utils are the names of the .png files in your images/icons folder. For a detailed walk-through of building sprites with Compass, head over to George Martsoukos’s article here on SitePoint. The above example illustrates how quick it is to get the image dimensions of a particular image from your sprite. I haven’t dug too deeply into all of the sprite utils, but check the Compass website for the full sprite documentation as I’m sure there are lots of other awesome things out there. There is an exciting world of front-end code out there and this is just a very small part of it. Start using Sass now! It’s made my code writing more efficient and it’s made writing CSS a lot more enjoyable. 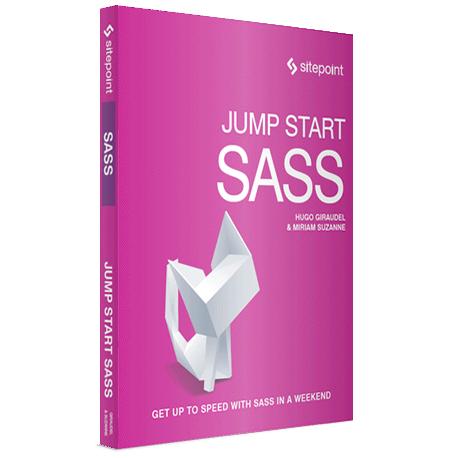 Get a Jump Start on Sass today! This book provides a comprehensive introduction to the popular CSS preprocessor Sass for beginners. Learn how to install and set up Sass and work with variables. Understand the difference between Sass and SCSS, and create color palettes and partials. Lastly, you'll cover functions and mixins. Darren is a true geek who has worked on the web for 15 years in the UK and New Zealand. By day, he's a director at the Auckland web agency The Fold where he designs and hand crafts responsive websites. By night, he's often found waxing lyrical about the latest front-end technologies.